The Game Master's Screen puts all of The Dark Eye's important tables and charts right at your fingertips. This four-panel GM screen provides detailed summaries of skill use, combat, magic, and miracles, which means less time looking for rules and more time enjoying the game. 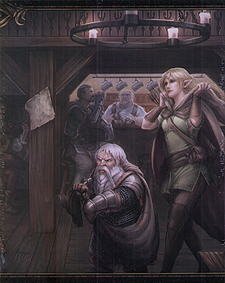 The Game Master's Screen also includes Inns and Taverns, a 48-page booklet with rules for popular tavern games, quality of goods, and pub brawls, new Focus Rules for the effects of Aventurian drinks, and tables for creating unique taverns - everything you need to add vivid and thrilling details to your tavern encounters. Each example includes detailed descriptions of important locations, residents, and patrons as well as a full color map. Use these examples when you need a new location quickly, or as inspirations for creating your own taverns and adventures.